We can all agree that rubrics rock – but why? Teachers rave about the ease and speed with which they can score assignments when using a rubric, as well as the “armor” that rubrics provide when they find themselves explaining grades to students (or justifying grades to testy parents). Students, on the other hand, report feeling far more comfortable knowing the specific criteria that they’ll be graded on. They’re happy to receive a healthy dose of transparency. Rubrics draw the bulk of their power from the clarity they offer as far as assignment expectations are concerned – for both the teachers assigning the work and the students completing it! 2. Avoid the cookie cutter! Be your own cookie! Part of what makes rubrics purposeful is the manner in which they are designed. The two most popular options – holistic and analytic rubrics. Holistic rubrics (e.g. a 6-point rubric that lists a slew of writing descriptors and allows a teacher to pin a ballpark score, such as a “4,” to an assignment) are popularly used for standardized tests. They are reliable when it comes to grading quickly and when it comes to training scorers and seeing consistent results (…considering that standardized tests are often graded “reliably” by individuals without college degrees speaks volumes about the power of holistic rubrics…). If you’re looking for a good way to grade that stack of 125 summer reading essays, the holistic rubric might be the best way to go. Analytic rubrics provide a good deal more detail regarding each skill being assessed, and typically provide a point-total to be earned for each respective skill. For instance, where a 6-point holistic rubric may score an essay a “4,” an analytic rubric might score the same essay a “6” on grammar and mechanics, a “5” on integrating textual evidence, and a “3” on connective thinking. The difference? An analytic rubric provides far greater detail – for students seeking to improve their work, and for teachers striving to assess specific skills while gathering data to effectively personalize future instruction. The disadvantage? These are a bit more time consuming – to create and to score – when compared with their holistic counterparts. Some food for thought: If you’re preparing students for CollegeBoard’s AP English Exam, should you score their rubrics using CollegeBoard’s 9-point holistic rubric (…designed for speed and reliability – meaning, you’ll be able to grade your kids’ essays quickly and you’ll likely give them the same score that CollegeBoard’s graders would…), OR, should you opt for an analytic rubric that provides significantly greater clarity for students with regard to the assignment’s expectations and their specific strengths and weaknesses? Should this essay earn a “3” – which translates to a letter grade? To a “B” (presuming a 3 is a “B” on a 4-point scale, where a 4 is an “A”…)? OR, should this essay earn a 12 out of 16 possible points – a 75% (…in other words, less than a “B”…)? The answer: It depends on your purpose. Consider the nuances. A popular solution to this headache is a “grading scale” where students’ scores on the rubric are then placed on a range – e.g. a “3.75 to a 4 equates to a 100%,” and so on. This works, but it’s duct tape on a larger problem. Conversely, if you choose to give a student who has scored 3’s across the board with a 75%, you’re sending a different message… In short, that 4’s are the expectation. This heightens rigor, but obviously, can be detrimental to students’ grades if not used with appropriate expectations and criteria. This protocol is especially effective if revisions of “final drafts” are permitted until students are comfortable with their writing (and their grades). Both systems work – as long as they’re couched in an appropriate context, and as long as the scoring system is clarified from the onset. By adding different weights to different pieces of criteria, the rubric serves a different and more specific purpose! When all scores default to “4,” the message is: “Your ability to double-check your grammar is as important as your ability to make brilliant inter-textual, evidence-based connections.” In contrast, reweighted rubric above places a significant emphasis on “connective thinking” and “using textual evidence,” while capping the maximum number of achievable “grammar points” to three. Here, a student who scored consistently down the third column would earn 21 out of 27 possible points – earning a 78%. Ah. That makes so much sense, my brain is tingling. A little creativity, coupled with the realization that rubrics are – like teaching – both an art and a science, can yield truly brilliant, practical, and effective results! 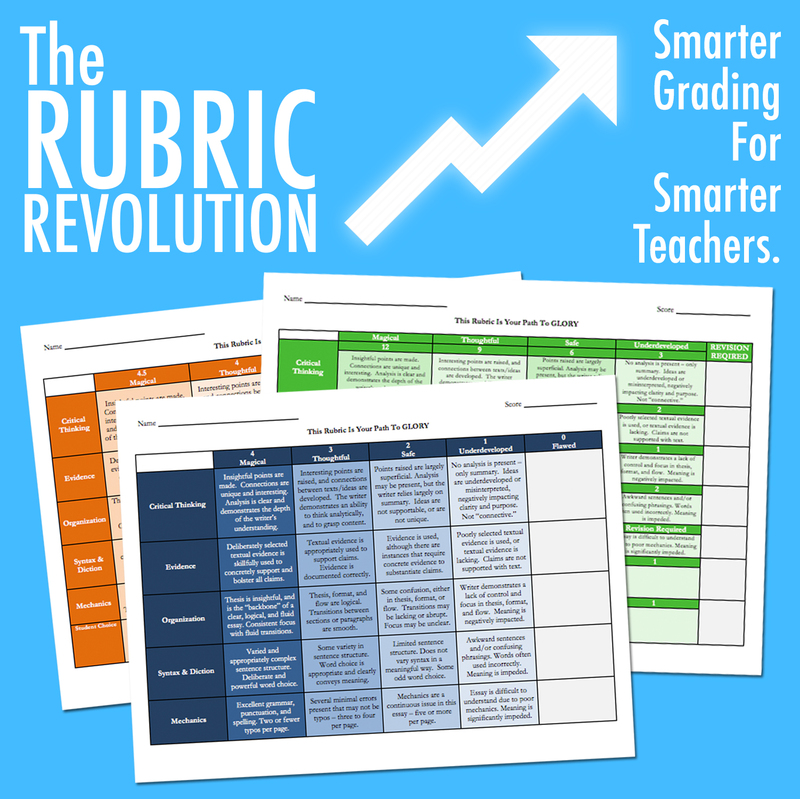 Take full advantage of the enhanced grading speed that rubrics provide! Not only will you feel much better after you burn through that stack of essays – but your students will reap the benefits of semi-immediate feedback. This is very important! Now, let me add that I presently have a stack of essays sitting beside me, and that I understand that “grade it fast” is much easier said than done. To that end, I have several suggestions. (#2) If you dig the Pomodoro Technique, or are simply interested in additional time-saving productivity hacks for teachers, check out Jay Meadows’ “Time Hacking For Teachers.” You won’t be disappointed! (#3) Check out TeachArgument’s awesome rubric bundle, which includes multiple variations (as discussed in this blog) AND the coolest peer-editing exercise ever: THE RUBRIC CUBE!